Practice Clinics: One Technical Director (TD) works with up to 3 different teams (but most often 1-1) at a time during a practice. The TD will lead and educate the coaches through the training sessions while the coaches lead and train the players. Game Observations: One TD will observe a weekend game and offer up a post-mortem set of feedback to the coaches with ideas for coaching/game management, substitutions, formations, player positioning, etc. This year, we are offering 1 on 1 or 2 on 1 sessions (teams vs TD's) with our Technical Directors. To sign up, email pgmcoord@eysa.org with the following information: Coach Contact information, team name, age, gender, practice time and location. Practice clinics will be divided into circuit training, with each coach directing a single drill for all the teams participating in the session. We have several EYSA Technical Directors who will be conducting these practice clinics across Bellevue, Issaquah and Mercer Island so their time will be restricted. The EYSA Technical Directors, as well as some of our more experience EYSA coaches, will be available to attend a limited amount games across EYSA to observe and report. If you are interested in signing up for a Game Observation session, please email pgmcoord@eysa.org and make sure you include your club, your team name, your age group, whether you play on Saturday or Sunday, and your full contact info (including cellphone). We will add you to the list, and as the TD's and coaches' schedules come available, they will contact you to find out where your game is on any particular weekend. Game observations will only take place for games played at an EYSA club home field. No away games outside of the EYSA boundaries. Game observations are available to any coach, but priority will be given to coaches who have already completed a TD practice session, as the game observations are much more valuable after an initial "grounding" from a TD practice. 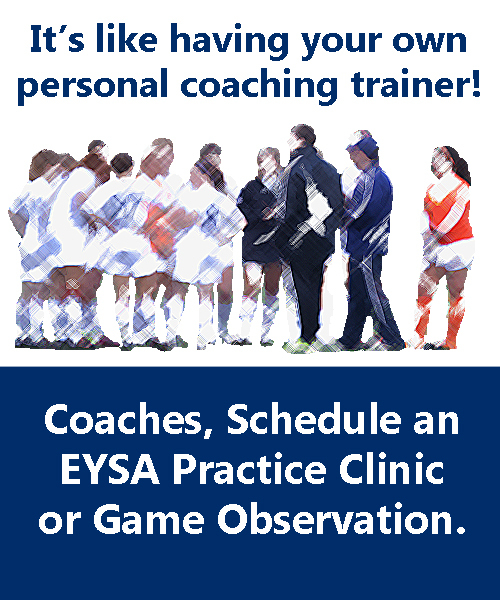 Schedule an EYSA Technical Director to assist at practice or observe your game. 1. What is the coach's name and email? 2. What is the age and gender of the team? 3. What is the date, time and location of the game or practice you'd like a Technical Director to attend?